Now that Labor Day has come and gone, and with it the temptation to give in to season creep, it’s time to start drinking some Marzens and Festbiers. We’re not going to the real Oktoberfest in Munich, which officially starts September 16th, but we do plan on paying our respects to the world’s most revered beer festival. We’ll do it by forgoing pumpkin beers for a few weeks and embracing one of our favorite styles, the Oktoberfest. Fortunately, Bay State breweries have gotten pretty good at making them, and even better at celebrating them with killer festivals. We’ve highlighted just over a dozen, from all over the state, that would definitely be worth your while. If you can’t be in Germany for the official start of Oktoberfest, then you may as well spend the day in Everett. That’s where Night Shift Brewing will transform its parking lot into a traditional German-style beer garden, complete with brass bands, food vendors, communal tables and lawn games. 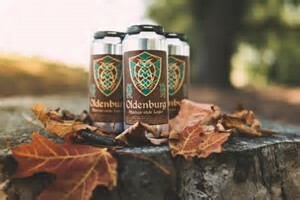 Six German inspired beers will be available, including Oldenburg, their annual Oktoberfest release. Admission is free and the event runs from 11:00 to 11:00. If you like traditional full liter pours when you Oktoberfest, head to the Notch Bier Garten. Just next door in Malden, Idle Hands will hold its Oktoberfest and Inaugural 5K run on the same day. In a partnership with the Malden Lions Club, they’ll will kick things off with the Run for Sight 5K at 10:00 am. Registration is $30, which covers admission to the race and party, and your first round. Festivities start at 11:00 and include food, beer, music, and fun. 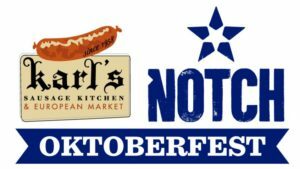 Sunday will be an even more funday in Salem, when Notch holds its Oktoberfest party at their downtown brewery. Liter pours of specially brewed lagers, German food from Karl’s Sausage Kitchen & European Market, and music from The Mad Bavarian Brass Band will keep things festive. They’ll take over a portion of their parking lot to increase capacity for the event, which costs $25 and includes a custom Steinkrug Maß (cermaic liter mug), live entertainment, and a whole bunch of Gemütlichkeit. Dorchester Brewing is among the many breweries Oktoberfesting on the 23rd, one of the busiest festival days of the month. Expect the German themed beers to be flowing from 11:00 to 11:30, along with plenty of traditional food, live music and other fun. Check their event page for more details soon. Cap Cod Beer’s Annual Oktoberfest will run from 11:00 to 4:00 and will feature Brats, pretzels, beer cheese, and a special seasonal release. Admission is free, but if you want to avoid the lines you can register for the VIP package, Which costs $40 and includes access to the faster VIP beer line, a souvenir Oktoberfest mug, 2 full liter pours, a pretzel, and a t-shirt. KBC Brewery & Beer Garden in Webster also has a full day of fun planned for their 3rd Annual Oktoberfest celebration. 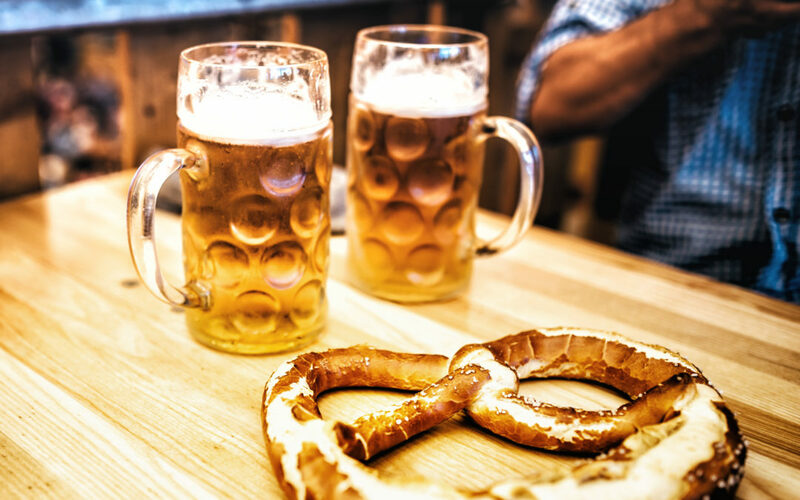 Attendees are encouraged to dress in traditional Oktoberfest costumes or bavarian colors (blue, white, and gold) for the event, and can enjoy German themed food and beer as well as live Polka music and team competitions. For something a little different, head out to Westminster for the Wachusett Brewing Rocktoberfest, which features three live bands and an awesome day of food, fun, and fall beers. If you haven’t been out to their new Brew Yard with its Airstream Trailer bar and copper kettle fire pits, this is a perfect opportunity. They’ll open up even more places to enjoy your favorite brews throughout the yard. Harpoon lays claim to the state’s oldest craft beer Octoberfest (28 years running) with sessions both Friday (5:30-11:00) and Saturday (1:00-7:00) at their Boston brewery. They’ll celebrate with beer, bratwursts, chicken dancing and more. General Admission tickets, which entitle you to entrance, a souvenir pint cup and one beer, are $25, but if you’re going Saturday you might want to opt for the pre-sale option (on sale September 14) which gets you in an hour earlier. Gardner, the “Chair City,” celebrates Oktoberfest with a one-of-a-kind chair luge race outside its downtown brewery. Not to play favorites, but hands down our favorite outdoor festival of the fall has to be the Gardner Ale House Oktoberfest Party in the Street. In addition to all the bells and whistles you’d expect (great food, beer, and music), they also have one of the coolest events we’ve seen anywhere: a chair luge competition where contestants race chair-themed go-karts down Parker Street as you watch and sip tasty house brewed beers. 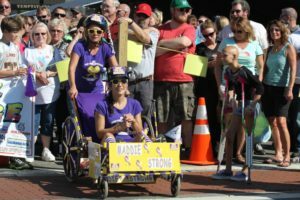 They also attempt to break the record for wold’s largest chicken dance and have a 5-K road race before the festivities kick off at 11:00. No admission charge, so bring cash and pay as you go. We’ll see you there. Medusa also has an Oktoberfest bash planned for Saturday, justified considering the number of German-style beers they’ve brewed over the last two and a half years. More details are on the way, but expect all-day music, liter pours for select beers, and even a stein hoisting contest. If you’re trying for your Oktoberfest Badge on Untappd then head out to Berktoberfest in downtown Pittsfield. From 1:00 to 5:00 you can hit up some of the best breweries the Berkshires has to offer, including Wandering Star, Big Elm, Barrington Brewery, Bright Ideas and a few others. General Admission is $30 and the VIP ticket is $50, both include unlimited samples. In conjunction with Hophead Events, Mayflower Brewing will host an Oktoberfest party and 5 Miler road race at the brewery in Plymouth. The $35 registration covers the road race and an engraved medal, as well as post race refreshments including a giant pretzel and two Mayflower beers. Details haven’t been announced yet, but Andover’s first-year brewery, Oak & Iron, is planning a Columbus Day weekend Octoberfest blowout. Word has it they’ll cordon off a larger than normal outdoor area alongside the Shawsheen River to make way for a real German Oompah band and have plenty of German food to go along with the release of their first Octoberfest beer. Can’t make it out to the brewery for Oktoberfest? Grab a Marzen or Festbier from your local beer store. We suffer from Cenosillacaphobia (fear of an empty beer glass – yes, it’s a real thing). If you suffer from Triskaidekaphobia (fear of Friday the13th) you can drink your fears away at Ipswich Ale’s Oktoberfest celebration at Spence-Pierce-Little Farm in nearby Newbury. The 21+ event will feature a traditional German Beer Hall under a tent where their Tapmobiles will serve delicious beer, brats, and baked pretzels. Tickets are $30 and include a commemorative mug, a brat, pretzel, and your first beer. Lederhosen and dirndls encouraged, but not required. If festival crowds just aren’t your thing, then head to your nearest Craft Beer Cellar and stock up on some local Oktoberfest offerings. A half dozen of our favorites are Jack’s Abby Copper Legend, Castle Island Festbier, Berkshire Brewing Oktoberfest Lager, Down The Road Henzellman’s Festbier, Fort Hill Red Prince Marzen/Festbier, and The Tap Brewing Company’s Marzen Scorseze, which you might have to go to the brewery for. We hope your Oktoberfest is filled with barrels of fun. Prost!